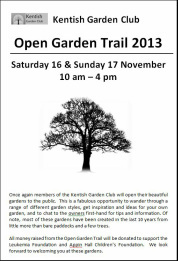 Once again members of the Kentish Garden Club will open their beautiful gardens to the public. This is a fabulous opportunity to wander through a range of different garden styles, get inspiration and ideas for your own garden, and to chat to the owners first-hand for tips and information. Of note, most of these gardens have been created in the last 10 years from little more than bare paddocks and a few trees. Entry to each garden is $3, and there is no charge for children. Some gardens will also have light refreshments available, as well as produce for sale. To download your copy of the brochure please click here. If you are unable to download the brochure, please contact us and we will be happy to send you a copy. All money raised from the Open Garden Trail will be donated to support the Leukemia Foundation and Appin Hall Children’s Foundation. We look forward to welcoming you at these gardens. and Elms over 100 years old, and paddocks. 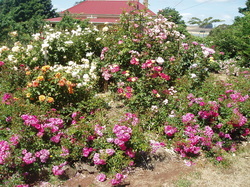 We renovated the house and started the gardens, specialising in roses in memory of our son, Lee, who died from leukemia 8 years ago. This has spread into the Raheen culminating in approximately 3000 roses, lots of rhododendrons, camellias and flowering trees. Now there is a children’s play area, water features, and whimsical additions in a naturally beautiful landscape. “Willow Bridge” has an interesting past, as it was the original Sheffield Pool constructed in the 1950s. It was the first Olympic sized pool on the North West coast, and a very popular venue. Due to the high cost of maintenance, the pool closed in the early 80s and we purchased the remains in 2004 set in blackberries and cracked willows. We built the house surrounding the original change rooms, and then the bridge across the pool and also a boardwalk. In the lower section of the garden a Japanese style garden is in progress. We specialise in rhododendrons but also have maples, wisteria, roses, weeping cherries, laburnum arches and lots more. planning our gardens self-sufficiency in fruit and vegetables was a primary goal, but we also wanted to indulge our passion for native and ornamental plants. The gardens you see today, whilst still a work in progress, reflect a blend of productive and ornamental elements, with lots of native plants to provide food, shelter and sanctuary for birds. Areas of interest include an animal-proof (floppy top) fence – it works! - espaliered heritage fruit trees , raised garden vegetable beds, and a wonderful mix of roses, clematis, ornamental trees ,as well as native trees and shrubs. Set on a large sloping block, this lovely informal garden has a variety of annuals, perennials and variegated plants of many textures and colours. 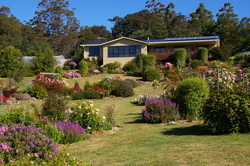 Jenny has used both native and exotic plantings to provide colour and foliage for most of the year. The garden also features a very productive vegetable patch. "Paloona Post" - It was a busy place once, as it was the site of the Paloona Post Office, hence the name. 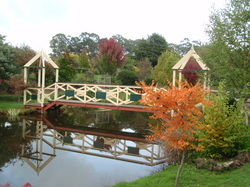 We have about 2 acres of gardens with a bit of everything - water features, fernery, meandering paths, and a selection of large deciduous trees; also cottage, exotic and native plants, and a large vegie patch. 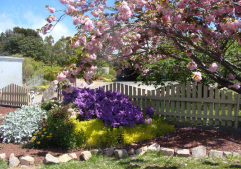 We once participated in the ABC Open Garden Scheme for a few years and enjoyed it immensely.